A four-year programme of events and exhibitions to commemorate the 100th anniversary of World War One has been unveiled by National Museum Wales. Its seven museums throughout the country will explore the unique impact of the war on Welsh people and life. 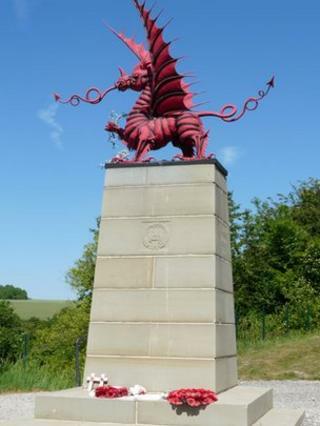 The battle of Mametz Wood where thousands of Welsh soldiers were killed and the death of wartime poet Hedd Wyn will be among the events marked. The first exhibition opens at National Museum Cardiff on 2 August next year. It will include a series of lithographic prints which were commissioned by the Ministry of Information in 1917 to encourage a war-weary public and raise support for the war effort. Staff at National Museum Wales will also be encouraging members of the public next year to help them plant hundreds of poppy seeds. And from 2015, St Fagans National History Museum near Cardiff will host trails to uncover the hidden histories of St Fagans Castle and gardens from World War One. Others events include how the war impacted on the woollen industry in Wales. The National Wool Museum in Drefach Felindre, Carmarthenshire, will look at the desperation of the woollen mills for contracts to keep them open. The National Roman Legion Museum in Caerleon near Newport will explore how weapons such as catapults for long-range battles have changed from the Romans to World War One. This starts on 31 January, 2015. There are also events at the National Waterfront Museum in Swansea, Big Pit National Coal Museum in Blaenavon, Torfaen, and the National Slate Museum in Llanberis, Gwynedd. Meanwhile, a remembrance service was held at Newbridge War Memorial, which now stands at the St Fagans museum, on Saturday morning. The Newbridge branch of the British Legion and former soldiers attended to commemorate the sacrifice made by soldiers in WW1, WW2 and other wars.